This charming house is part of a former farm house that produced wine, olive oil, fruit and vegetables. The complex consists of four free standing houses and two apartments. On your own terrace, under the pergola, you can enjoy the garden and the breathtaking view. Go for a swim in the shared, panoramically located pool. You'll be surrounded by the gorgeous green hills of the Chianti. Rest on one of the sun beds. Near the pool is an atmospheric room that has cooking and eating facilities, ideal for preparing lunch! You'll have your own barbecue, convenient for ending the day with some culinary arts! During the say you can make numerous trips to explore the Tuscan area! Start with visiting Chinati; the characteristic landscape and the picturesque towns such as Greve in Chianti and Radda in Chianti (both 20 km away). 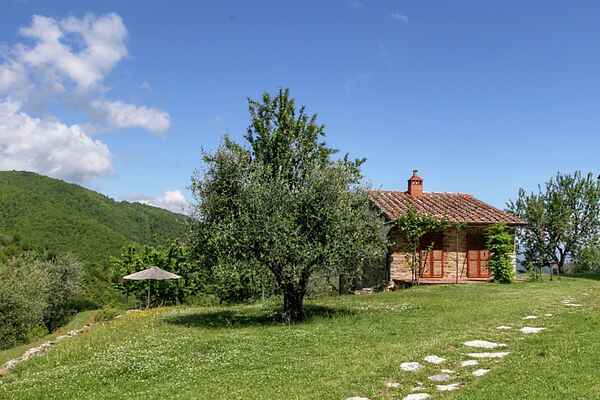 The house is a perfect base from which you can explore the impressive cities of Florence (40 km) and Siena (35 km). If you take the train at the train station in S. Giovanni (7 km) you'll be in Florence in less than 30 minutes! Arezzo (35 km) and Cortona (45 km) are also recommended.